Well, the summer is well under way and so is the #TransitTrial #MultiModalTrial. My mornings are now consumed with checking the weather and bus schedules. 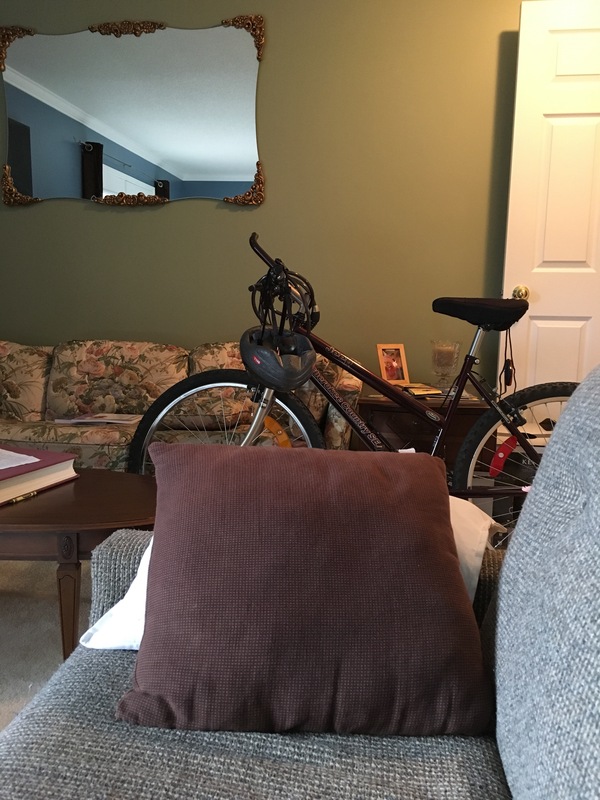 My backpack is always sitting by the door and my bike is always at-hand, sitting in its place in the living room. Living in a townhouse, I’ve learned that storage can be tricky and leaving the bike outside is not any better than inside. As I’m preparing for my day today I realized I haven’t blogged in a while. The daily grind finally got to me. The new routine has settled in and the daily overwhelm comes with it. I have certainly been grateful for the opportunity to save some money by using transit and biking. I am also grateful for the opportunity to incorporate activity into my schedule since I haven’t been able to go to the gym. But to be honest, the added time restraints make the daily schedule a lot more complicated. I no longer have the extra time for mental preparation of my day or physical preparation of meals. I get home later in the evening so I am less motivated and get less done around home. I leave earlier in the morning so the same thing could be said for that time of the day. The catch 22 is that I’m saving money in travel but spending more money in pre-made meals because I have less time and energy to work with overall. In one way, the transit trial and multimodal trial are great for mental health in that I don’t have to battle traffic from behind the wheel of a car. It gets me out into nature which produces happy chemicals in my brain. Also, the exercise I wouldn’t otherwise get produces those same endorphins. The time spent on the bus or waiting (or riding bike) can be seen as useful downtime for my brain and an opportunity to practice mindfulness exercises. These are all positives in my mind. But, on the other hand, the extra planning needed and the extra time for travel means I have less time and mental energy for other things in my day. With my brain injury I go to bed fairly early, or I at least need a lot of sleep (no matter what time I actually hit the pillow). Then waking up and getting going in the morning often requires more time as well. So, here I sit, staring at the clock…realizing it’s taken me a good 30mins just to compile these thoughts and write this blog. I’m on my way downtown for a couple of stops before I see my clients in Oakridge this afternoon. Best get myself together and the day organized. I think I’ve begun to realize that although it’s possible to take transit for the job I have, it’s not practical and/or recommended if you have the choice. But I guess that’s the whole point of the “trial”, right? I set out to prove a point as well as save some money. And I think I’ve proven that point. Our transit system is not “good enough already” as some may have you believe. I am still an advocate for Bus Rapid Transit in the city of London and will continue to be even though I have a car and choose to transport myself in multimodal ways. Thank you to my followers for journeying with me in this trial. I apologize for the lack of writing about my activities recently. I’ll attempt to update more in the coming days.